It’s an organisation built from the foundation up, resting on Aboriginal cultural authority and sound corporate management. It’s fired by strength of purpose and consistency over many years. 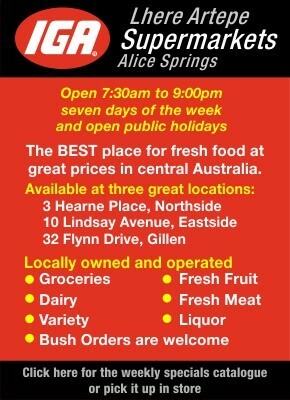 And it works as a partnership between Aboriginal and non-Aboriginal people. 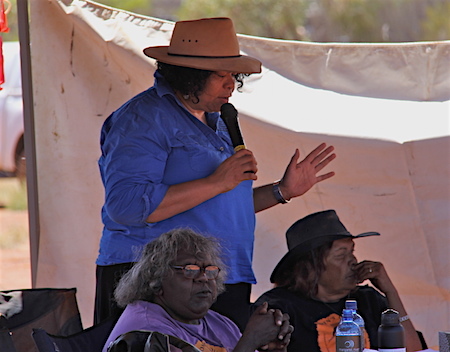 Andrea Mason (pictured) is talking about the Ngaanyatjarra, Pitjantjatjara and Yankunytjatjara (NPY) Women’s Council, which she has headed up since April 2010. In this role she has been honoured twice in 2016, as Northern Territory Australian of the Year and Telstra Australian Business Woman of the Year. She’s pleased of course but sees the awards as an opportunity to talk about the organisation and what it has achieved rather than her personal story. I learn only that her father was a Ngaanyatjarra man, a language speaker himself but determined that his children grow up highly proficient in English. This came at the expense of them speaking Ngaanyatjarra, something that Ms Mason is trying to rectify now. Some 6000 people live in the tri-state NPY region, some 350,000 square kilometres straddling the NT, South Australia and Western Australia. The majority speak English as their third or fourth language; English is the “trade language”. Acquiring some facility with the local Aboriginal languages is seen as desirable for all council staff, Aboriginal and non-Aboriginal. They make headway best when they live on community and become immersed in the language in their everyday lives, says Ms Mason. The council was established in 1980, when land rights within South Australia were being campaigned for (they were granted for the Pitjantjara Yankunytjatjara people in the following year). Women’s issues “were not in the front of mind in those discussions” but the women were not prepared to leave it at this. Their aspirations included the protection of women’s sacred sites, but what was innovative, says Ms Mason, was their willingness to look also at “what was corroding communities”. High on the list was petrol sniffing amongst young people and the ill effects of unemployment. Left: Ms Mason at the 2016 AGM with today’s leaders, Chairperson Yanyi Bandicha and Deputy Chairperson Sylvia Benson. Photo by Nick Eakin. “They were strong in advocacy, this was the focus for the first 12 years, speaking up on those issues that they had identified from the outset,” says Ms Mason. They started to see that they were being listened to. 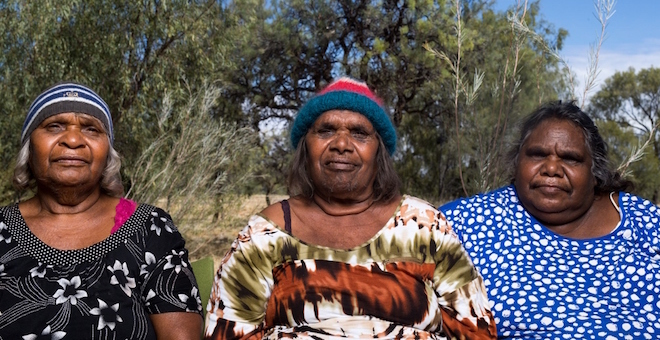 This gave them the confidence to support to Arrernte women, in 1983 and again in 1991, when they were campaigning against the construction of a dam at Junction Waterhole north of Alice Springs, which threatened to destroy their sacred sites. Some men supported the women’s goals but “you couldn’t say that the women were handed their recognition on a silver platter”, says Ms Mason. They had to fight for it. They knew it would be critical to find non-Aboriginal women with the skills to help them. The first to fit the bill was Diana James, a fluent language speaker, who became the first coordinator (a position now called CEO and held by Ms Mason). “It’s a women’s organisation and an Aboriginal organisation but it’s founded on collaboration in a dynamic work environment, where everyone can be heard, everyone can make their contribution,” says Ms Mason. This helps the council attract high quality staff in growing number, including men. It’s important to have women at the helm in some of the council’s services, says Ms Mason. These are the Domestic and Family Violence Service and the Child Nutrition Program, which now includes a Youth Program, the Ngangkari Program (Anangu traditional healing, physical and mental) and more recently, Intensive Family Support and a children’s advocacy position (a support position for families in contact with the child protection system). However, a man heads up human resources, for example. The ideal for the council is to have Aboriginal and non-Aboriginal co-workers in lead positions but that’s very challenging for budgets. It was more critical, says Ms Mason, during the formative years, the 1980s and ‘90s. In her leading role, however, she works very closely with the board, especially its chairperson, Yanyi Bandicha. Going beyond advocacy to the development of services began in 1993 with small projects in areas which women felt were their primary responsibility, where they had authority. 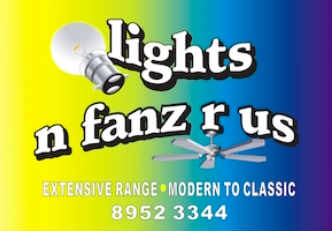 The first was based in Mutitjulu and focussed on disability. The work was to establish how many people in the region had a disability, with a view to getting them the help they needed. This was followed by a domestic violence project in 1994; the founding of Tjanpi Desert Weavers as a social enterprise in 1995; then the Child Nutrition Program starting in 1996. “There was no masterplan, it was very organic, and very powerful,” says Ms Mason. 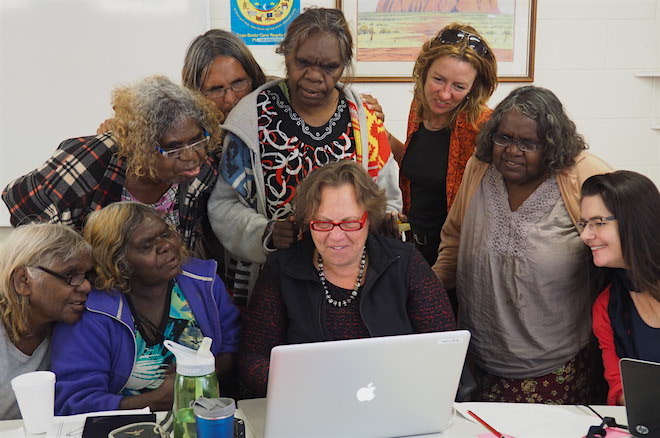 Above, from left, in two-way partnership, Valerie Foster, Aniwari Mitchell, Mamie Butler, Theresa Nipper, Rene Kulitja, Linda Rive, Jo Foster, Judy Brumby and Sam Togni. This has seen the council grow significantly. When Ms Mason joined as senior advisor and project manager in 2008 there were 50 staff, now there are between 120 and 140. However, growth has not been for growth’s sake. Each expansion has been built on steady developmental work and integration of that work into the council’s overall vision and operations. For example, the Ngangkari Project, which began in 2002, has grown to include work on improving mental health “literacy”. She sees it as literally a “think tank” that in the future will support the development of new ideas in dealing with systemic issues in Aboriginal communities, based on new understandings and knowledge. Angela Lynch is the Ngangkari Program manager, coordinating this new endeavour given the name Uti Kulintjaku in 2012. This is a Pitjantjatjara phrase meaning “to think and understand clearly”. Alongside actual treatments, the ngangkari have long been involved in advocacy with mainstream health providers. 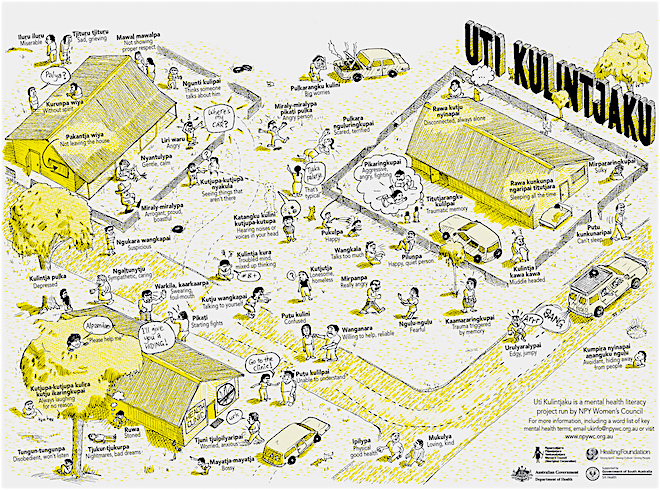 So the work of Uti Kulintjaku (UK) began by focussing on the very language of mental health, a two-way communication between the senior women involved (about 20 of them) and mental health professionals, including Dr Marcus Tabart, psychiatrist and clinical director of mental health services at the Alice Springs Hospital. 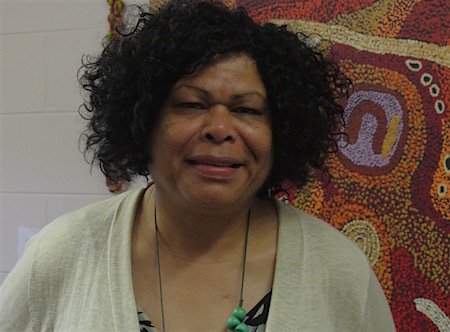 “Anangu have been totally fascinated to hear about the Western model of understanding how the brain works, about how psychological assessments and diagnoses are developed,” says Ms Lynch. In turn, they have explored their cultural understandings – in their own languages, transmitted through an interpreter – for states of being, for how the world is perceived, how society functions, how things are felt. The workshops have become something like group therapy sessions, with the women sharing their personal stories and supporting one another, but out of this they have also developed resources, relaying their new “literacy” so it can be used by others. Among the resources are some excellent posters, with illustrations accompanied by bi-lingual captions, one describing a wide range of mental and emotional states (below), the other describing the child development cycle, both in contemporary Anangu settings. The posters remind or teach people about these practices as well as the language people can use to talk about their experiences of life. The women had observed that many young people’s vocabulary for their feelings had been reduced to “happy, sad, and angry”, says Ms Lynch. The richer Anangu vocabularies collected for the posters promote a deeper conversation. She says people across the region have put the posters up in their houses, and the council is also hearing stories of the posters being used by staff in health services, even by police. Pronunciation of Anangu words is assisted by the Kulila app, a “crowd-sourced dictionary” to which new words (written, spoken, translated) can be added, also developed by the UK project. It is in part out of this work that some innovative thinking about the prevention of domestic and family violence is developing. The council’s service focussed on this scourge – Atunypa Wiru Minyma Uwankaraku: Good Protection For All Women – was first established in 1994, at a time when there was no police presence in region. The council mounted a successful campaign for this to change, with police stations now in several major communities. On the case management side, the service until recently had been limited to crisis response – getting the woman out of harm’s way – as well as post-crisis care, including helping her develop a safety plan and get through her court processes. “Although it’s early days we now feel we can do more about prevention,” says Melissa Lindeman, manager of the service. It is not uncommon for women in the region (and in remote communities generally) to want to remain in the relationship while wanting the violence to stop. They also may not have as many options for leaving as elsewhere. This makes casework very complicated. The way forward seems to be through integrating casework with prevention: each caseworker, instead of working just with a caseload of individuals more or less in crisis, is tasked to get to know three communities, two of them in depth. Right: Screen capture from an animation by the UK project, exploring the language around deep feelings of fear and the ways to deal with them. Drawing by Katelnd Griffin. Supported by the council’s directors and other senior women, the caseworkers undertake a mapping exercise of who is who in the community, to work towards a community level response to the violence (each community is different). “If relationship building is gone about in the right way, community members come forward. This is not about us telling them what to do,” says Ms Lindeman. One community is already developing a community-wide safety plan, after local staff at the school approached the caseworker who was well-known to them. She started a conversation, consulted widely, scheduled a workshop. This means collecting data, reviewing progress, something the council is not shy of. 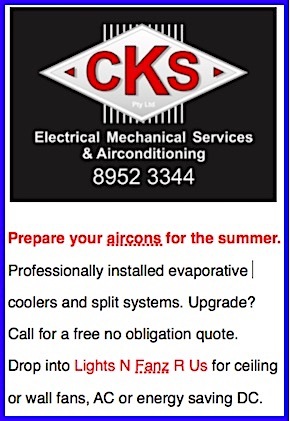 Ms Mason provided an up-to-date list of evaluations and reviews, some of them organisation-wide, others focussed on particular services. Most of them were conducted by external bodies (government departments, universities, consultants) but interestingly one review of the DV Service was undertaken in 2015 by the UK Project. It was looking at what “proper help” looked like; at the characteristics of a good worker (in Anangu settings); at who a woman trusts to talk to if she is experiencing domestic and family violence. The review also advised, through a workshop conducted by the UK team, on how staff can talk to Anangu women to find out if the DV service is helping them. Another contribution from the UK project is a broadening vision of working with men to achieve behavioural change. In a similar two-way process as that embarked upon by the women, it will help the men find aways to talk about trauma and violence and to recognise the way it is damaging everyone – themselves and those around them. “If communities are driving this kind of deep change themselves, there is a much better chance of it happening,” says Ms Lindeman. At the whole organisation level, there are other developments that Ms Mason is excited about. 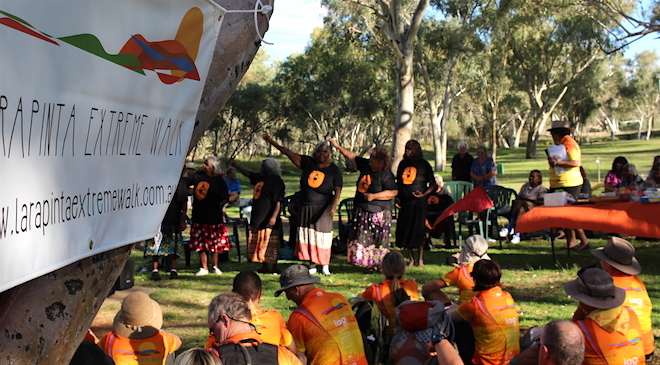 Above: Trekkers raising funds for NPY women’s law and culture meetings get to hear first-hand from the women about what the country means to them. Photo by Angela Lynch. 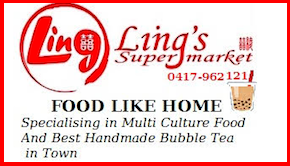 One is the on-going partnership with Jawun, an organisation that grew out of a meeting between The Body Shop and Noel Pearson back in 1995. “Noel Pearson understood that often what Indigenous organisations need is not more money but more expertise,” says Ms Mason. Jawun helps put in place secondments to Indigenous organisations of people with useful expertise from amongst their corporate partners – banks, universities, governments, industrial groups. “We can’t always find the right people to fill a gap or don’t have the funding to do so. The corporate partners fund the placement of their secondments, we provide the workplace experience and support for working in an Aboriginal community context. “We don’t approach the partnerships with a hand out, but as equal partners. “For people who work in Melbourne, Sydney, Brisbane, they tell us they take more away than they give, it is so personally transformative. Out of one of these placements has grown an invaluable long-term friendship. Tony Messenger was seconded to the council from Insurance Australia Group in 2013 to help develop the council’s strategic plan. His commitment to the council’s work led to him organise the Larapinta Extreme Walk to support the NPY women’s annual law and culture meetings. At the start of their 11 day adventure on the Larapinta Trail, trekkers come together in Alice Springs where they have the chance to meet with council members as well as with Arrernte people, to hear about how Aboriginal people lived prior to contact, about what country means to them, the importance of its protection, the challenges. “It’s giving messages that are not all about a deficit approach,” says Ms Mason. And it raises serious money: $115,000 in 2015; $139,000 in 2016. Ms Mason is keen to see the walk become a focus for corporate leadership development programs. “Aboriginal people make up only 3% of the population, yet we are often dealing with the weight of the 97% in the way things are structured and perceived. We want to shift power so that Aboriginal people are sitting with governments and corporations, not in a relationship where we come cap in hand,” says Ms Mason. 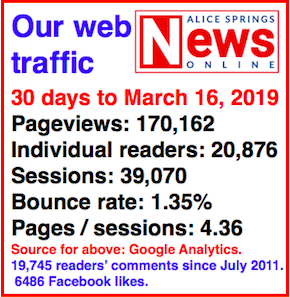 Looking back on the council’s record, she says everyone agrees that their greatest achievement has been dealing with sniffing, including their 10-year fight to have Opal fuel rolled out. Getting renal dialysis into communities was another 10 year fight, with funding won in in 2015 for machines to go into four – one at Docker River (NT), another at Pukatja (SA), and one each in Warburton and Wanarn (WA). “It seems it often takes 10 years to achieve change,” reflects Ms Mason. “It’s about increasing our knowledge in the mental health area, in the ways that parents support children, that men talk to other men. When young people see this, it gives them a sense of purpose and hope. Eventually this will spread out across the population. “Often services come in to Aboriginal communities and provide the knowledge, but in our model, the knowledge is within the clients, people have to be the agents of change in their lives. Below, from left, Ngangkaris Maringka Burton, Pantjiti McKenzie, Josephine Mick. Photo (cropped) by Rhett Hammerton. Not many people would be aware of Andrea’s sporting background. Andrea was one of the first two Aboriginal athletes to be awarded a residential scholarship at the Australian Institute of Sport in 1981. Australian netball coach Wilma Shakespeare saw great talent in this South Australian teenager, selecting her with Marcia Ella from NSW. While on scholarship, Andrea and Marcia worked for the National Aboriginal Sports Foundation in the suburb of Woden in Canberra. Two happy, brilliant, caring young ladies who had the sporting world at their feet and who at the same time demonstrated remarkable strength of character. Then when a devastating training accident on the court wrecked Andrea’s knee and her career before it had begun, her sporting dream came crashing down. Marcia went on to netball greatness for team Australia before retiring and giving her life to caring for her community. For Andrea, it could have been the end, but it proved to be just the beginning. With the same strength of character and single-minded determination that she showed on the court, Andrea returned home to SA, put her head down and went for it in the community. To where she is today. On the board of the NASF at the time Andrea worked in its office was a fellow South Aussie, Faith Thomas, Australia’s first Aboriginal cricket player to play test cricket, the NASF female Member for SA. Faith is to be honoured by Cricket Australia in the upcoming test series in 2017. Andrea is following off the field in Faith’s groundbreaking footsteps. And in step with Marcia. Three wonderful, utterly amazing women, perfect role models for all young Aussie girls in sport and in the community. As the New Year dawns, they are living proof that if you believe, you can – and will – achieve.